room house constructed of hewn logs. It has a large fireplace made of native stone, used for heating and cooking, and all indications are that it had a dirt floor. The house was later enlarged with two additional rooms and other structural improvements. 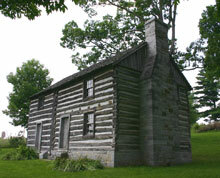 After Pastor Flohr's death is 1826 the home was owned by his widow, Elizabeth Baer Flohr, until her death in 1858. The Flohr House has been owned by a number of persons since that time. In 1984, when the house faced destruction for a real estate development, effort was initiated to save the old Flohr home and to relocate it on the St. John Church property. The house was purchased by Everett Kegley, then disassembled, moved to the new site, and reassembled using stone from and spring house and chimney for the foundation. The project to develop this house into a museum continues as funds become available from private contributions.